This demonstration portfolio invests the maximum allowable 401(k) in stocks. In the absence of choices within the portfolio, we shop outside the portfolio using the combination of return forecast and quality rating to identify candidates to be added to the portfolio. Total assets reached $1,000,000 in 17 years. Total assets are $1,092,174 (4/30/13) and the net asset value is $244.09. The model portfolio gained +3.01% during April 2013. The S&P 500 checked in at +1.70% for the month. 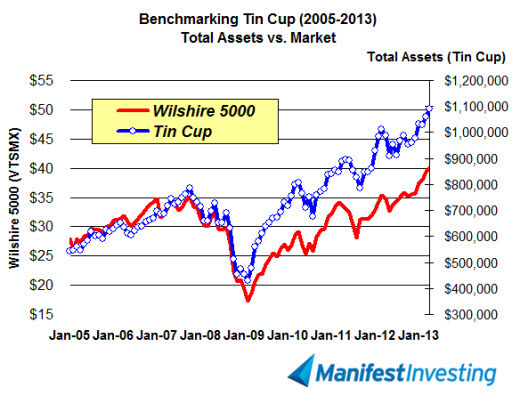 Tin Cup has generated a 6.1% annualized total return over the trailing five years vs. 5.8% for the S&P 500 for a trailing 5-year relative return of +0.3%. Tin Cup has outperformed the S&P 500 over the trailing ten years by +0.7% and the annualized total return since 1995 is now 19.0%. With MIPAR at 6.6%, our target for the minimum overall portfolio PAR is at least 11.6%. The overall portfolio PAR is 11.3% on 4/30/2013. Quality and financial strength are sufficient at the current levels of 92.4 (Excellent) and 92%. EPS Stability is 85 for the portfolio. Sales growth is a little “light” at 9.1%. We challenge the lowest MANIFEST rank (return forecast + quality) holding, Strayer (STRA) and replace it with C.H. Robinson, the Solomon Select featured stock for May — taking advantage of the higher quality and return forecast. Our $1917 and dividends for May are destined for Qualcomm (QCOM) based on the higher MANIFEST rank for the company. Looking at the companies at the top of the sweet spot, there’s a group concentrated at a return forecast of approximately 15%. The nod goes to QCOM on the strength of its quality ranking.